The perfect Xilisoft YouTube to iPad Converter is capable of downloading and converting YouTube videos to iPad videos and music in only one-step with fine-quality retained. Just one click on the YouTube videos, you can download and convert them to iPad videos formats such as 720p H.264 HD video, H.264 video and MPEG4 with superior quick speed. Besides, it can download and then convert YouTube videos to iPad music in format of MP3 or WAV. Xilisoft YouTube to iPad Converter also provides a built-in YouTube video browser for you to browse/search/download YouTube videos more conveniently. Multi-threading processing and batch conversion maximize the processing speed and enhance the performance to a great extent. Download and convert YouTube Videos to iPad videos in format of 720p H.264 HD video, H.264 video or MPEG4. Download and convert YouTube Videos to iPad music in format of MP3 or WAV. 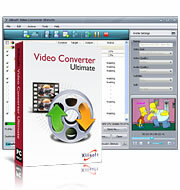 Convert FLV format videos on your machine to iPad videos. Downloading/converting operates in really high speed due to the multi-threading processing feature. The distinct YouTube video browser displays videos by different types for you to browse/search/download videos directly from it. Right click on the video, drag and drop the video to Xilisoft YouTube to iPad Converter or begin downloading/converting straightly in YouTube video browser. Multiple downloading/converting tasks can be processed at the same time. You can also set the max tasks number to optimize the performance. Proxy server configuration is available to fulfill your further need on website viewing and network protecting. Exit, hibernate, shutdown, standby or no action after the downloading/converting tasks completed. Available in English, German, Japanese, French, Simplified and Traditional Chinese languages interfaces.